VPN, virtual private network is a network configuration that allows you access to your work, home or business network at a straight. Most time you will need to know what is happening in your office, home, café, hotel etc. with a Well configured VPN access you can work from anywhere around the world with easy and it will look like your just there and right there while you’re here. So here in this tutorial am going run down step by step on how to configure a VPN using mikrotik device. I will be working with diagram above. So that assuming your aside your aside your office you will be able to access your network from anywhere. From the diagram we have your phone or your laptop. Your are also connected to the internet from where ever your are. A modem which connects your MT device to the internet. 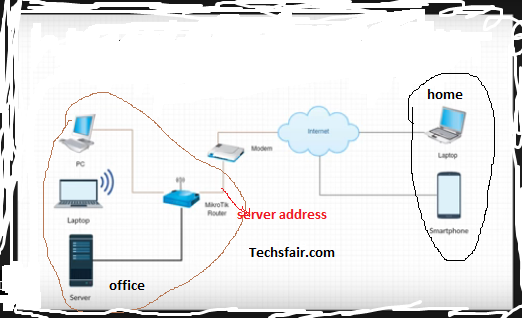 Mikrotik device located in your office with computers and servers connected to it. Ok first of all you must have come across mikrotik devices, use them, and being able to access them using winbox. But if you have not, no problems because it is an easy and straight do it yourself steps. So without much delay, let’s log into your device. Using MT winbox to log in. Click on quick seton the top right menu. Leave the VPN addressthe way it is because that come by default with all mikrotik devices and that address is unique, and accessible to the internet, however, we are going do some configurations on it to make it more authentic. 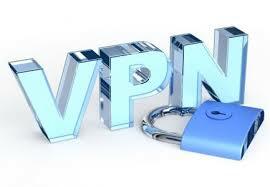 VPN password,make sure you use a secure password to avoid unauthorized personal authenticating into your network. And then check the box hide, click on apply and ok.
After that, click onPPP on the left side menu, on the head tag click on profile. Double Click on default encryption profile. On the DNS we will type the address of our router which 192.168.88.1 with this, we are done here so we click apply and ok.
Now we have to create our VPN connection either usingwindows or any of your devices but in this tutorial am using windows. So let start: click on windows setting >>>> network and internet, click on VPN and click on add VPN. Then add the following in the dialog boxes provided. Connection name….. You can name it anything for this tutorial Techsfair.com/office1. Server address …. 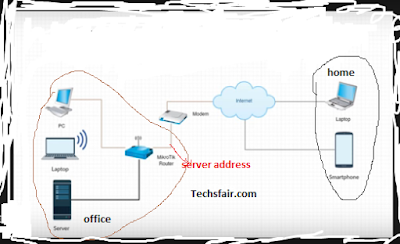 We are going to put in the address that exist between your modem and mikrotik device. Now that we have successfully created a VPN connection, next thing is to test the connection. And then let’s go back to PPP. Click on active connection and you will see the IP that is currently connected to your network. Click on the red plus sign to add, all you need is a user ID and password and in the profile dialog box should always be on encrypted mode. One other major thing to do now is to create port forwarding on the internet device i.e the wireless router your using to connect to the internet so that it will forward traffic to the MT device. once you have created it your sure that you can now have full access to your network from anywhere around the world.